"Cookie Editor" extension provides a toolbar popup to read and modify all cookies related to the current page. 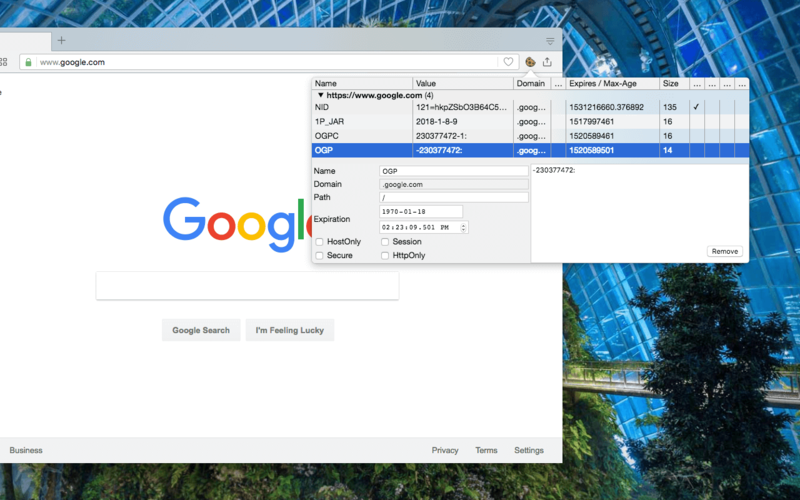 The extension gathers all the hostnames that are present in the top frame and all its subframes and then fetches all the cookies related to these hostnames. These cookies are listed in separate groups. You can view cookies and their values and even you can edit each cookie or perhaps remove it. To view all cookie related properties, select the cookie and check the editor section. What is the "Cookie Editor" extension and how does it work? What is the meaning of each item in the editor section? Path: this is useful to limit the cookie access to the specified path only (not all pages in the same domain will have access to this cookie). To ignore this option use “/“ value. Expiration date: this option will tell your browser when this cookie is supposed to be invalidated. This option is mandatory unless the cookie is set only for the current session which invalidates the cookie when the browser is closed. HostOnly: if the HostOnly flag is true and the canonicalized request-host is identical to the cookie’s domain. If it is false and the canonicalized request-host domain-matches the cookie’s domain. Secure: if this option is checked, your browser will not provide the cookie in clear text format. How can I edit a single cookie? Simply select the cookie and all its properties will be populated in the editor section. Now edit whatever that is needed and press the save button. If you need to start over, use the "Reset" button which ignores the current values and read them once again from the stored cookie. How can I delete a cookie? Exactly similar to the editing section, select a single cookie and press the "Remove" button. Note that removing a cookie is not reversible action. Still, you can create a new cookie with the same name and value once again. To delete multiple cookies, use the checkbox next to each cookie and select multiple items, then click on the "Delete" button. Can I export selected cookies and import them later? Yes, in the editor, select those cookies that you need and then press the export button. The extension will save all these cookies in the JSON format (the file will be located in the default download directory of your browser). Use the options page of the extension to import this JSON file. Can I search for cookies without opening the destination URL? Yes, use the right-click context menu item over the toolbar button to bring the search box up. Now enter the domain and then press the Enter key. Cookie Editor will open in a new browser tab with cookies belong to the search query.